I'll come right out and say it: I enjoyed Ode to Kirihito because it's the closest experience I've ever had with a comic book to watching a really good Sam Fuller movie. Ode to Kirihito tells the story of Dr. Kirihito Osanai, a young and handsome doctor who is close to discovering the cause of Monmow Disease, a malady that causes people to have their features become like that of a dog. This discovery, that the disease is caused by some environmental source, proves politically inexpedient for his mentor, Dr. Tatsugaura, who plans on using his own theory that the disease is passed from carrier to carrier to launch himself into a nationwide medical office. Taking advantage of his influence, a bit of money that falls his way in anticipation of future power, and the fact the young doctor has no reason to see it coming, Tatsugaura causes Kirihito to become infected with the disease while out in the field. It's there the story really begins, that of Kirihito's rise out of this dire circumstance. 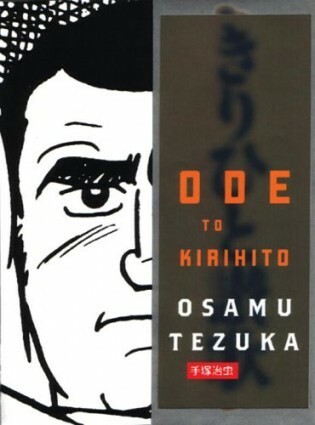 Ode offers a few strong subplots: Kirihito has a fiancee, and meets a pair of women on the road, one of whom he marries. Perhaps the most fascinating story is that of Dr. Urabe, Dr. Osanai's colleague, sort-of rival and approximate replacement. As befits the two doctors' working relationship, Urabe undergoes a journey that is much like Osanai's but also a mirror image, similar in its spiritual implications but internalized and moral while Osanai's is environmental and best negotiated by action. Urabe goes from someone who gives into his urges in the most self-indulgent way to someone capable of a long, tortured, but genuine love affair with a woman named Helen afflicted with the disease. Most of the characters in Ode to Kirihito are appealing in some way, even the ones that don't have a whole lot to do. I believe Ode to Kirihito will be well-liked by many in its English-language audience because despite the fantastic conceit and treatment of same that feels at time lashed to genre convention, it remains a serious drama with a strong focus on unpleasant and thus realistic-seeming personality traits run amuck. 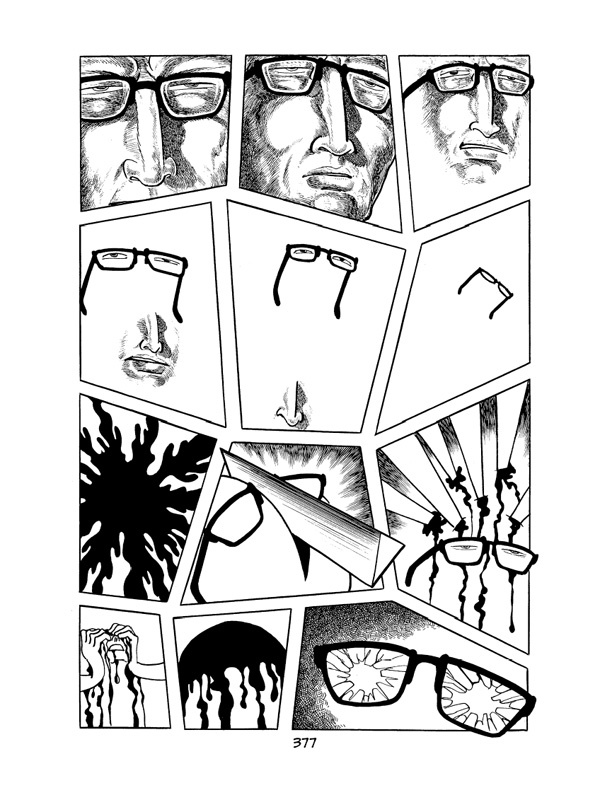 If the book's range of effects reached no further than Tezuka's feel for doctor to doctor competition, it would still be a pretty good book. But there's a lot more going on. 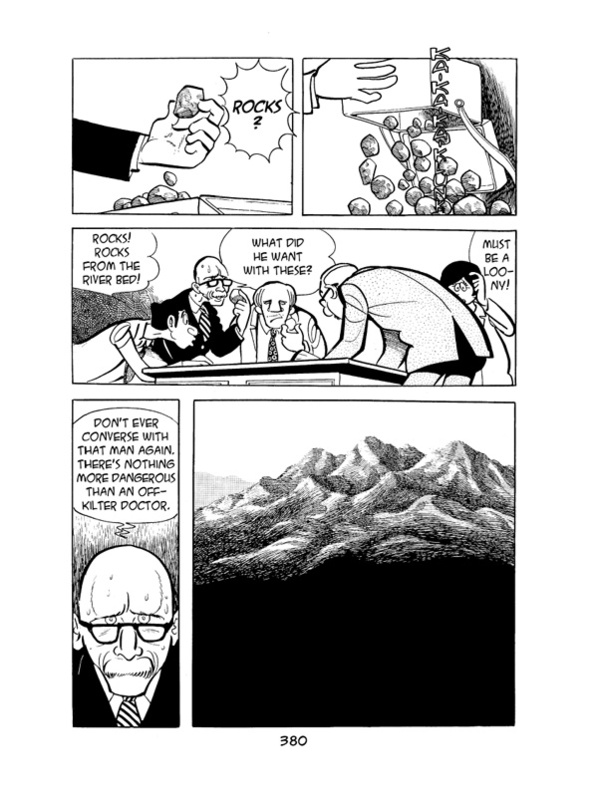 For example, Tezuka offers up a lovely treatment of Christian themes and imagery, a respectful if not soulful view of the religion as a path to spiritual enlightenment and inner peace here on earth through the virtues of forgiveness, service and humility. This nod in the religion's direction fits in a thematic sense with the beast/man dilemma the story explores in more literal fashion. I may like Ode to Kirihito better for its junkier aspects than its work with adult themes, the way the narrative careens from situation to solution, how Tezuka infuses the romantic storylines with a weird, desperate energy, the way that certain characters get paired off in order to make some really blunt but necessary comparisons. 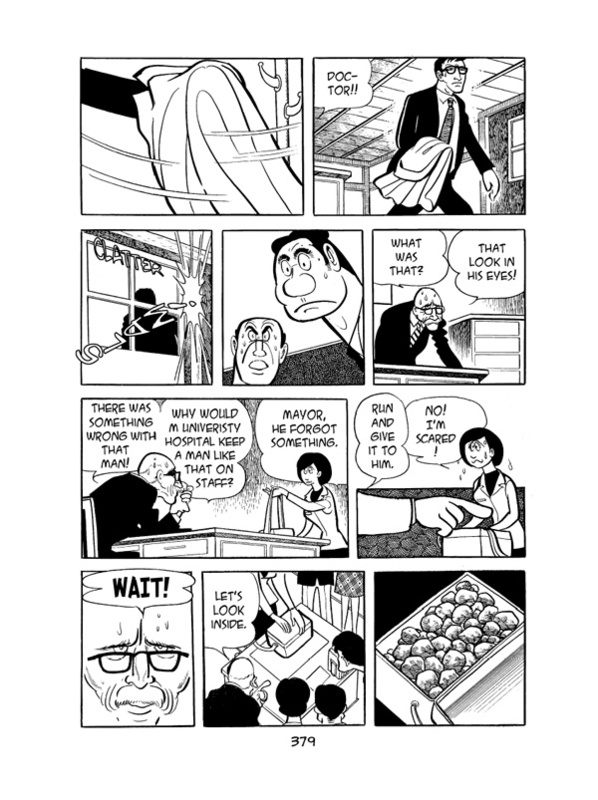 Ode to Kirihito proves eminently readable, and very entertaining; it's even fun to look at, almost from page one. Still, what I enjoyed most of all and what really makes this book special in my mind are the frequent, bravura displays of cartooning, one of which you'll find right below. 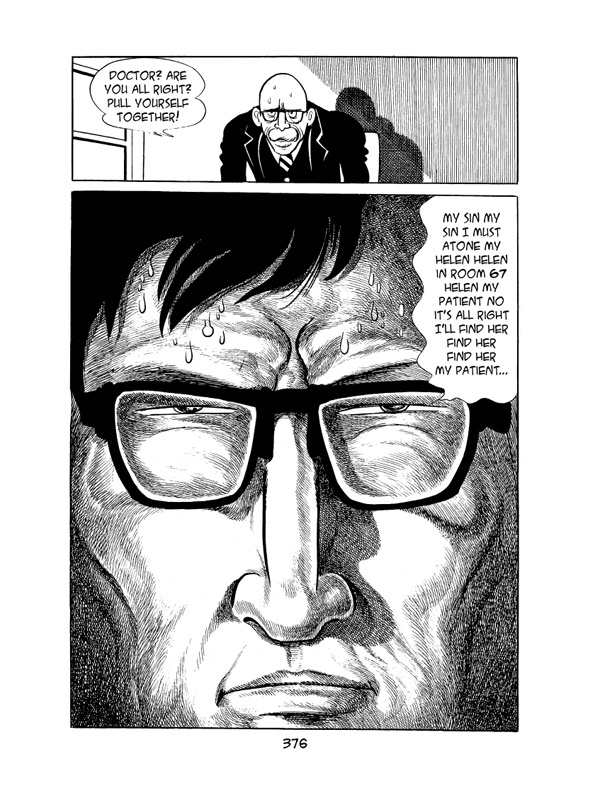 That's Dr. Urabe, of the more internalized spiritual journey, falling into a bad place. Dr. Urabe's breakdown starts with that grim close-up, rendered in greater than usual detail. This causes the reader to slow down, and suggest a shift in reality that often comes with such moments of lucidity. 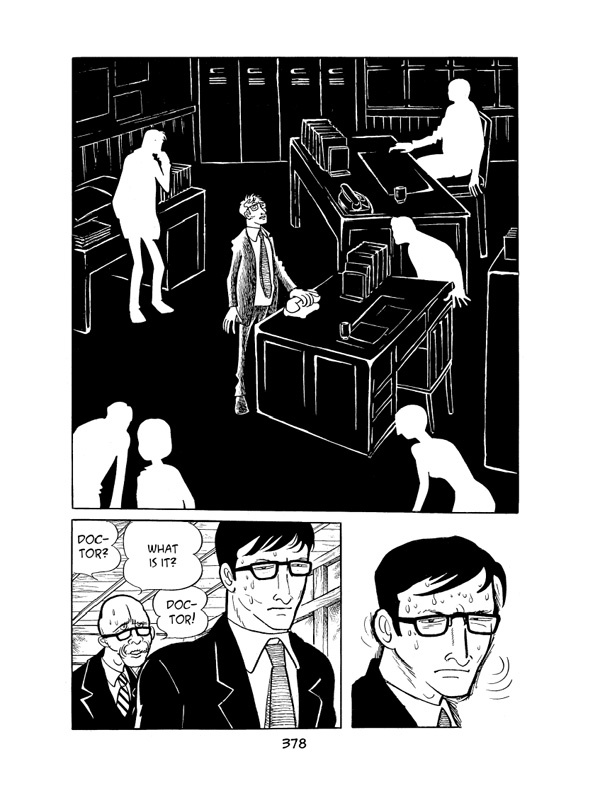 Tezuka then switches over to a highly stylized depiction of how deeply torn the character is, how he feels as if everything about him has been broken down into its component parts. Most cartoonists would stop here. And then: wow. I love the top panel on page 178, which freezes the moment in time in disturbing and dramatic fashion, ripping the character out of the world in which we've watched him live since the works' first few pages. That's just a great damn transition, a perfectly-pitched effect that punches the reader in the face with Urabe's alienation and sets madness loose licking at the corner of every panel in which Urabe appears for the rest of the book. That's the kind of thing that reminds me of director Fuller's White Dog or Shock Corridor, which were also genre mongrels brought to heel so powerfully and with such igenuity that while you might not be able to argue the sensibility on display is an adult one, the execution certainly reflected an adult artist's choices and more than satisfied that level of interest. There are about a half dozen sequences in Ode to Kirihito as good. So, Ode to Kirihito: a lot of fun on the surface, a potent mix of genres underneath, some beautiful if oddly distanced theme work if you look for it and several moments of masterful cartooning. I spent about four nights with the book and in the early evening before the last three I broke into a smile when I remembered I got to read some more pages before I went to sleep. I hope you enjoy it half as much as I did.